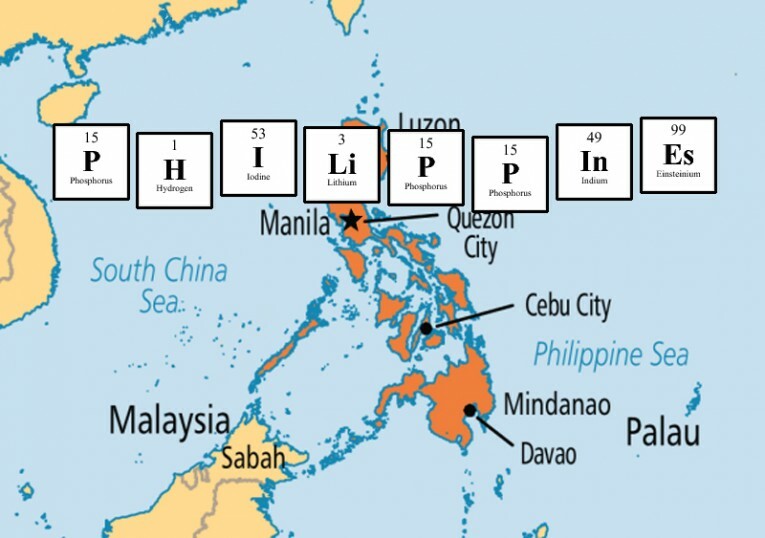 What’s the longest country name you can spell entirely using chemical element symbols? – You do not have to say the full name of the elements, but you do have to break it down into the component symbols. – As an example, you could have Be-Ni-N (for info: Beryllium, Nickel, Nitrogen). – Country names would be based on the ‘Short Name’ used in the ‘List of sovereign states‘ wikipedia page, using the UN Member / Observer states list. – If the country has more than one word, you can delete the spaces and treat it like one word. Same goes for apostrophes. – Any non-English characters can be anglicised (e.g. São Tomé -> Sao Tome). – For simplicity, if the country may start ‘The ______’, you can ignore the ‘The’. – You can’t look up chemical element symbols nor countries. – You can repeat symbols, but a bonus point will go to the answer using the most unique elements. – Scoring would be 1 point per letter of a successful country. – For the example above, you would submit your answer as ‘Be-Ni-N’, not ‘Benin’, and you would score 5 points. Not only is this now quite a long quiz question, but it’s also going to be quite hard to work out the answers. With element symbols containing either 1 or 2 letters, there are many possible ‘spellings’ to test for each country. Even for our example Benin, we need to test: ‘B-E-N-I-N, Be-N-I-N, Be-Ni-N, Be-N-In, B-En-I-N, B-En-In, B-E-N-In, B-E-Ni-N. That’s 8 options… just imagine the possibilities with Democratic People’s Republic of Korea (yep, that’s the short name!). So I decided if I’m setting the question, I need to have definitive answers – a script was in order! I set something up in Perl as it’s pretty flexible (and forgiving) with this kind of problem. I decided the best way to solve the issue of multiple ‘spellings’ detailed above was to randomise the format of the country and loop through many times to catch all variations. This way, we’d not only find all countries that can be spelled using element symbols, but all variations of the symbols used too. and so on… to catch all the variations, I set the loop to try 1000 iterations. In the end I tried 10000 to make sure, but a few hundred loops seemed to pick up all the variation most of the time. Longest country name: U-Ni-Te-Ds-Ta-Te-S* – 12 letters. Most elements used: P-H-I-Li-P-P-I-N-Es** – 9 elements. Most unique elements: S-I-N-Ga-P-O-Re*** – 7 unique elements. ***also U-N-I-Te-Ds-Ta-Te-S, but this has one repeating element. Singapore also had the most variations, with 6 different options. There are a few countries that can be made up of only 2-letter elements (La-Os, Cu-Ba, Po-La-Nd, Mo-Na-Co), but none from only 1-letter elements. I think the most pleasing to the eye is Ne-Th-Er-La-Nd-S.
Th-Eu-N-I-Te-Ds-Ta-Te-S-O-F-Am-Er-I-Ca – 15 elements, 13 unique. Th-Eu-Ni-Te-Ds-Ta-Te-S-O-F-Am-Er-I-Ca – 14 elements, 13 unique. Going through those 15, the USA is comprised of: Thorium, Europium, Nitrogen, Iodine, Tellurium, Darmstadtium, Tantalum, Tellurium again, Sulfur, Oxygen, Fluorine, Americium, Erbium, Iodine again, and Calcium. If you want to see all the variations across the 35 unique countries, here are the results in full. Am I pleased I spent my time on this? Yeah. Was it a valuable use of my time? Well – if, like me, you love a good quiz question, then I’d have to say yes again. And if you’re not impressed that ‘The United States of America’ can be spelled using only chemical element symbols all in a row, then I’m clearly talking to the wrong audience! And finally, this exercise did use the 2016 elements of Nihonium (Nh), Moscovium (Mc), Tennessine (Ts), and Oganesson (Og), but they didn’t feature in any of the end results. Perhaps as we discover more elements and new countries form, these answers could change… watch this space! This entry was tagged analysis, chemistry, countries, data, elements, geography, quiz, research. Bookmark the permalink.